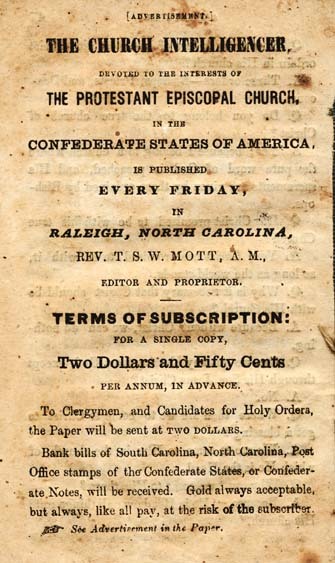 The publisher's advertisement following p. 47 has been scanned as an image. 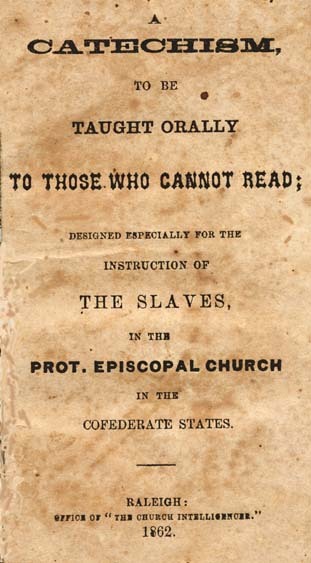 Protestant Episcopal Church in the Confederate States of America $ v Catechisms -- English. OFFICE OF "THE CHURCH INTELLIGENCER." Quest. WHO made the world? Q. What did God make? Q. Yes, God made the world. Did He make any thing else? A. He made all things in the world. Q. What are some of the things in the world? A. Water, trees, cattle, and men. Q. Yes, God made the world, and all things in the world:--Who then made you? Q. What were you made of? A. "Of the dust of the ground." A. God has told me so. Q. Where has God told you so? A. In His own book, called the Bible. Q. What is God's book called. Q. What do you say God has told us in the Bible that you were made of? Q. Who do you say made you "of the dust of the ground?" Q. Now, that you are made, can you keep yourselves alive? Q. Can your parents--your father and mother-- keep you alive? Q. Who, then, keeps you alive? A. God keeps me alive. Q. How does God keep you alive? A. He gives me air to breathe, and water to drink. Q. What else does He give you? A. He makes the corn grow for my food. A. He makes every thing grow that I eat. A. By giving me air to breathe, and water to drink, and by making every thing grow that I eat. Q. Can you live without eating and drinking? Q. God keeps you alive, then, you say, by giving you things to eat and drink? Q. Who do you say made you, and keeps you alive, by giving you what you eat and drink? Q. Is God, then, a good or a bad being? A. He is a good Being. Q. Is there any other being as good as God is? A. No. God is the best of all beings. Q. Who is the best of all beings? Q. WHO do you say made all things? Q. Did He make them good, or bad? A. He made them good. A. He has told me so in the Bible. Q. What has He told you? A. That He made all things good. A. That He looked down upon every thing He had made, and saw it was "very good." Q. In what book has He said this? Q. Was man, at first, made good? A. Yes, God made every thing good, and He made man good. Q. Did man continue to be good, as God, at first, made Him? A. No, he became bad. Q. How did he become bad? A. By sinning against God. Q. How did He sin against God? A. By doing that which God had commanded him not to do. Q. Did God always command what was right? A. Yes; God is too great and good to command what is wrong. Q. You say God always commands what is right; ought not man, then, always to do what God commands? A. Yes; man ought always to do what God commands. Q. You say that God made the first man good; did the first man continue to be good? A. No; for he did not always do what God commanded. Q. What was the name of the first man? Q. Where did God put Adam when He made him? A. He put him in the Garden of Eden. A. The Bible, God's own book, tells me so. Q. Did He make any other person and put there with Adam? Yes; He made a woman, whom He called Eve, and gave her to Adam to be a help to him. Q. What did God command Adam and Eve to do in the garden? A. He commanded them to dress and keep the garden. Q. What did God command them to eat? A. He commanded them to eat of the fruit of every tree in the garden, but one. Q. What did God command them not to eat? A. He commanded them not to eat of one tree which grew in the garden. Q. What was that tree called? A. It was called "the tree of knowledge of good and evil." Q. You say God commanded them not to eat of this tree: Did they mind God? A. No; they disobeyed God; and ate of the forbidden tree. Q. How did God know that Adam and Eve disobeyed him? A. God sees everywhere, and He saw them do it. Q. Can God see persons when they are alone in some secret place? A. Yes; God sees every one of us all the time. Q. Can He see us in a dark night? A. Yes; God can see us in the darkest night. A. The Bible says, "the darkness hideth not from God." Q. God saw Adam and Eve, then, when they ate the fruit of the forbidden tree? A. Yes; He saw them when they thus sinned against Him. Q. Was not God angry with them for breaking His command? A. Yes; He was very angry. Q. Did He punish them for it? A. Yes; for He had told them, if they disobeyed Him, He would punish them. Q. How did He punish them? A. He drove them out of the Garden of Eden. Q. What else did he do to them? A. He cursed them and their children for their sin. A. He cursed, or sent evil on them and their children for their sin. Q. You said that God sent evil upon Adam and Eve, and upon their children, for sinning against Him; Who are their children? A. We are their children. Q. Yes; we descended from them, and therefore are their children; Are we then sinners? A. Yes; we are all sinners against God. Q. Why are we all sinners? A. Because we all break God's commandments. Q. Is there any way by which we may be saved from the curse of sin? A. Yes; God gave His Son Jesus Christ to save us. A. He is the Son of God. Q. Where was Jesus Christ before He came to save us? A. He was in Heaven with God. Q. Well, but is He not Himself God? A. Yes; He is God the Son. Q. With whom was He, then, before He came to save us? A. He was with God, the Father. Q. You say He came to save us--did He come to save any body else? Q. Who did He come to save? A. He came to save us and all mankind. Q. Why did He come to save all mankind? A. Because all mankind are sinners. Q. What is it to be a sinner? A. It is to be under the curse of sin, for being a breaker of God's law. Q. You said that Christ came, to save all mankind: Why did He come to save them? A. Because all mankind were sinners. Q. What did Christ do to save them? A. He died for them. Q. How many did He die for? Q. Why did He die for all mankind? A. They who break God's law. A. The Bible says that "sin is the transgression of the law." Q. How many have broken or transgressed God's law. Q. Are all sinners, then? A. Yes, all are sinners. Q. Does the Bible say all are sinners? A. Yes; The Bible says, "all have sinned." Q. You say that God says in the Bible, that all are sinners;--How does God know this? A. God knows every thing. Q. How does He know every thing? A. Because He is always everywhere, and sees every thing. Q. Does He see actions that are done in the dark and secret places? A. Yes; For nothing can hide us from God. Q. Does He hear all bad words? A. Yes; For God is with us whenever we speak. Q. Does God know all bad thoughts? A. Yes; God sees into our hearts, and knows all, the thoughts we think. Q. Why, then, are all mankind sinners? A. Because they think bad thoughts, speak bad words, and do bad things. Q. What thoughts and words and things are bad? A. Such as God has forbidden. Q. If all mankind, then, think the thoughts, speak the words, and do the things which God hath forbidden, ought they not to be punished for it? A. Yes; All mankind for their sins deserve the wrath and curse of Almighty God. Q. What do their sins deserve? A. God's wrath and curse. Q. How may they be saved from God's wrath and curse? A. Through their Saviour Jesus Christ. Q. WHAT did Jesus Christ do to save them? A. He died to save them. Q. How did Jesus Christ die? A. He was nailed to a cross of wood, by the wicked Jews. Q. In what way did they nail Him to the cross? A. They drove nails through His hands and feet, and fastened Him to the cross. Q. How long did He hang on the cross? A. Till He was dead. Q. What did they do, to see if He was dead? A. They thrust a spear into His side. Q. Who put Jesus Christ to death? --Could He not, then, have delivered Himself out of the hands of the Jews? A. Yes; Jesus Christ could do every thing. Q. Why, then, did He let the Jews kill Him? A. Because He chose to die. Q. Why did He choose to die? A. To save us from our sins. Q. To save us from what? Q. Was He not, then, very good and merciful to die for our sins? A. Yes; He was very good and merciful, to die for our sins. Q. You say Christ died to save us from our sins;--What is it to be saved from our sins? A. It is to have our sins forgiven, and taken away from us. Q. What is it to have our sins forgiven? A. It is to get rid of being punished for them. Q. What is it to have our sins taken away? A. It is to have our desires to sin, or to do bad things, taken from our hearts. A. It is to have desires to do good things put into our hearts. Q. What, then, is it to be saved from our sins? sin in hell, and from the wickedness of sin in our hearts and lives. Q. WHAT must we do to be saved from our sins? A. We must be sorry for them. Q. What must we do? A. We must be sorry for our sins, or repent of them. Q. What else must we do? A. We must be baptised, or christened. Q. Why must we be baptised, to save us from our sins? A. Because God, by St. Peter, the Apostle tells us we must. Q. What does St. Peter say? A. He says:--"Repent and be baptised every one of you, in the name of Jesus Christ, for the remission of sins." Q. What does He say we must do first? A. He says we must "Repent." A. It is to be so sorry for our sins, as to make us stop sinning. Q. What does St. Peter say we must do next? A. He says, "we must be baptised, every one of us." Q. How many of us? A. "Every one of us." Q. In whose name does he say we must be baptised? A. "In the name of Jesus Christ." Q. Why, in the name of Jesus Christ? A. Because, "there is no other name given, whereby we can be saved." Q. For what purpose does He say we must be baptised? A. "For the remission of sins." Q. When St. Paul was converted, what did the minister tell him to do? A. He told him to "arise and be baptised, and wash away his sins." Q. When parsons are baptised, whom does St. Paul say they were baptised into? Q. Whom does he say, "they put on?" A. He says they "put on Christ." Q. HAVE you been baptised, or christened? Q. Why were you baptised when you were children? A. Jesus Christ says, "Suffer the little children to come unto me, and forbid them not, for of such is the kingdom of God." A. It is the Church on earth, and in heaven. Q. Who is the Head of this Church? Q. When you were baptised into Christ, where were you put? A. I was put into His body, the Church. Q. What did you get when you were baptised into Christ? A. I got my name. Q. Why do you call it your Christian name? A. Because I was baptised into Christ, or made a Christian in my baptism. Q. But did you not got more than a name in your baptism? A. Yes, I got more than a name. Q. Certainly you got more than a name; for you said St. Peter told the people to be baptised, to have their sins forgiven. What then did you get in baptism, besides a name? Q. Did you not get God's Holy Spirit also? A. Yes, I got the Holy Spirit also. A. He is the third person in the Godhead. Q. What do you mean by the Godhead? A. I mean three persons in one God. Q. Which is the first person? Q. Which is the second person? Q. Which is the third person? A. God, the Holy Ghost. Q. Which person did you say you got in your baptism? A. The third person; God, the Holy Ghost. Q. What do you mean by getting the Holy Ghost, or Holy Spirit, in your baptism? A. I mean that I am put into the body of Christ, where the Holy Ghost comes into my heart. Q. What does the Holy Ghost come into your heart for? A. To make me hate all that is bad, and help me to love and do all that is good. Q. INTO what state, then, were you put at your baptism? A. I was put into a state of salvation. Q. What do you mean by a state of salvation? A. I mean a state in which, through Christ, I may be saved. Q. So you are baptised into Christ, as your Saviour, are you? A. Yes; I am baptised into Christ, as my Saviour. Q. How ought you to feel towards your heavenly Father, for so great a blessing? A. I ought to thank Him with all my heart. Q. What ought you to do for so great a blessing? A. I ought always to obey my heavenly Father. Q. If you do not obey Him, what will He to you? A. He will punish me. Q. Should you not fear, then, to disobey your heavenly Father? A. Yes, I should always be afraid of disobeying Him. Q. Does God see you when you disobey Him? A. Yes; "He is about my path and about my bed, and spieth out all my ways." Q. You have been taught that, in your baptism, you got your Christian name, got the remission of your sins, and the gift of the Holy Ghost. Now this means that, at baptism, "You were made a member of Christ, a child of God, and an inheritor of the kingdom of heaven." What were you made at baptism? A. "I was made a member of Christ, a child of God, and an inheritor of the kingdom of heaven." Q. Yes, you were baptised into Christ, as have been taught, and so became " a member of Christ." How did you become a member of Christ? A. By being baptised into Christ. Q. I told you that Christ is the Head of the church;--What, then, is Christ's body? A. The church is Christ's body. Q. Where are we told that Christ is the Head of the church? A. In that part of the Bible called the New Testament. Q. Where are we told that the church is the body of Christ? A. In the New Testament. Q. When you were baptised, you became, you say, a member of Christ;--As a member of Christ, how ought you to live? A. I ought to live a holy life, as Christ lived. Q. What ought you to do? A. I ought to do good, as Christ always did. Q. You said that, in your baptism, you were, made, also, 'a child of God;'--Were you a child of God when you were born? A. No; I was the child of the wicked one. Q. What is it, then, to be made "a child of God" in holy baptism? A. It is to be taken out of the family of the wicked one, and put into the family of God. Q. Yes, in holy baptism, you were made "a child of God";--As a child of God, what ought you to do? A. I ought to love and obey my heavenly Father. you were to have when you were grown up, if you were good children, you would know what I meant, would you not? Q. And you would be anxious to be good children, that you might get the rich gift, would you not? Q. Well, then, I have come to tell you that Jesus Christ, your blessed Saviour, when He died upon the cross, left you all a rich gift, in heaven, called "eternal life;" and when you were baptised, you were put in the way, if you are good children, of getting that rich gift in heaven--that eternal life;--And so you are called "inheritors of the kingdom of heaven:"--What, then, is it to be made an "inheritor of the kingdom of heaven" at your baptism? A. It is to be put into the way of getting "the gift of God, which is eternal life." Q. If you are thus made inheritors of the kingdom of heaven, ought you not to strive every day to get to heaven? Q. You said that, at your baptism, you were made a member of Christ;--If you do not do good as Christ did, will you continue to be his member? A. No; I shall be cast away from Christ. Q. You said that, at your baptism, you were made a child of God;--If you disobey God, will you still be His child? A. No: If I disobey God, He will not let me be His child. Q. You said that, at your baptism, you were made inheritors of the kingdom of heaven; but will you get eternal life in heaven, if you do not strive to go there? A. No; but I shall be sent down to hell. Q. How are you to strive or try to go to heaven? A. I must have nothing to do with the devil and his works;--which I gave up at my baptism. Q. In what way are you to shun the devil and his works? A. By keeping within me no bad thoughts; by speaking no bad words and by doing no bad things. Q. What do you mean by keeping within you no bad thoughts? A. I mean that I must not hate any body, nor wish to hurt any body, nor wish to do any wrong. Q. What do you say you mean by keeping within you no bad thoughts or wishes? A. I mean I must not hate any body, nor wish to hurt any body, nor wish to do any wrong. Q. What do you mean by speaking no bad words? A. I mean that I must not tell lies, nor call hard names, nor curse and swear. Q. Who is the Father of lies? A. The devil is called, in the Bible, "the Father of lies." Q. Why is he called the Father of lies? A. Because he told the first lie; and because he tempts every body else to tell lies. Q. What was the first lie that the devil told to tempt mankind? A. He told Adam and Eve, in the garden of Eden, to eat of the forbidden fruit, and it should not hurt them; when God told them it should hurt them. Q. When they listened to the devil, and ate, did the fruit hurt them? it would, when he said it would not. Q. Does the devil try to make men think now, as he did our first parents, that sin will not hurt them? A. Yes; he tempts men to think now that sin will not hurt them. Q. But does sin hurt them? A. Yes; sin always hurts those who do it. Q. So the devil is the Father of lies, because he told the first lie, and because he always tries to make men think that lies, and other bad words will not hurt them? A. Yes; he is the Father of lies because of this. Q. Whose children, then, are those who tell lies, use hard names, and curse and swear? A. They are the children of the devil. Q. When, in baptism, you become the children of God, what do you promise to renounce or give up? A. "I promise to renounce the devil," or to tell no lies, use no hard names, and not to curse and swear. Q. But if you do this after having been made the children of God, what will you again become? A. The children of the devil. Q. What do you mean by doing no bad things, such things as the devil tempts you to do? A. I mean that I must not hurt any body; must not disobey my parents--[nor disobey my master] nor disobey God. Q. But can you not disobey your parents [and your master] without their knowing it? A. Yes; but God knows it; for God always sees me. Q. WHAT else must you do to get to heaven? A. I must believe all that God has told me about the way to get there. Q. In what book has He told you how to get there? A. In His own book, the Bible. A. The Old Testament and the New Testament. Q. In which part has God told you most about getting to heaven? A. In the New Testament, or the Gospel. Q. What does the Gospel tell you about getting to heaven? A. It tells me about my Saviour, who showed me how to get there. Q. Did your Saviour do nothing more than show you how to get to heaven? A. Yes; He died to open the way for my going there. Q. Does not the Gospel tell you, too, a good deal about God the Father, and God the Holy Ghost? A. Yes; It tells me about God the Father, who made me and all the world;--about God the Son, who redeemed me and all mankind;-- about God the Holy Ghost, who sanctifieth me and all the people of God. Q. How much of the Gospel did you promise at your baptism to believe? A. I promised to believe all the Gospel. Q. What are the chief parts of the Gospel called in the promises of your baptism? A. They are called "the Articles of the Christian Faith." Q. Yes; they are called the Articles of the Christian Faith; Where are these Articles of the Christian Faith put together? A. They are put together in the "Apostle's Creed." hear you;--all saying it slow; first after me. A. "I believe in God the Father," &c.
Q. What do you chiefly learn in these articles of your belief? A. "First, I learn to believe in God, the Father," who made me and all the world; Secondly, in God the Son, who redeemed me and all mankind; Thirdly, in God the Holy Ghost, who sanctifieth me and all the people of God." Q. In order to get to heaven, you say, you promised to give up, or renounce the devil and all his works; and to believe all the Articles of the Christian Faith; but did you not promise still more? A. Yes; I promised also to keep God's holy will and commandments, and walk in the same all the days of my life. Q. What do you mean by God's commandments? A. I mean all that God has told me to do in the Bible. Q. Where are the chief commandments put together? A. In the ten commandments. Q. How many of these commandments are there? Q. What did you say you promised to keep? Q. You were baptised when you were infants;-- how, then, could you promise to keep these commandments, at your baptism? A. I promised by my sponsors. Q. Who are your sponsors? A. Those persons that answered, in my name, when I was baptised. Do you think that you are bound to believe and do what your sponsors promised for you? A. Yes; I do think so. Q. You promised, you say, to keep the commandments;--How must you feel towards God and man, in order rightly to keep them? A. I must "love God with all my heart; and my neighbor as myself." Q. How must you show that you love God with all your heart? A. I must show it, in delighting above all things to worship and obey God. Q. How are you to show that you love your neighbor as yourself? A. I am to show it by always doing my duty to my neighbor, as God has commanded me. A. Every body who lives with me, and around me, and has the control over me. Q. Can you name some persons? A. My playfellows, [my master and mistress] and my parents. Q. How are you to show your love to your playfellows? A. I am never to curse them, nor hurt them, but to try always to do them good. Q. How are you to show your love to [your master and mistress] and your parents? A. I am never to lie to them, to steal from them, nor speak bad words about them; but always to do as they bid me. Q. But can you keep the commandments without some one to help you? A. No; I cannot do it of myself alone. A. God says, in the Bible, that "we are not sufficient of ourselves, to think any thing as of ourselves." Q. By what means, then, are we to keep God's commandments? Q. How are you to get God's help? A. By praying for it. Q. Who has told you so? Q. What does He say? A. He says, "ask, and it shall be given you." Q. Must you not feel that you want what you ask for? Yes; I must feel that I want the things I ask for. Q. Suppose, right after dinner, you should go to your mother and ask for bread, when she knew you did not want it, would she give it to you? A. No; because I asked for what I did not want. Q. If you kneel down, then, and pray to God to help you to do good, when you don't wish to do good, will He give you His help? A. No; because He sees into my heart, and knows that I don't wish Him to help me. Q. What, then, is it to pray to God? A. It is to ask God for what I wish to have. Q. Has our blessed Saviour given us the words of a prayer? A. Yes; He has given us the words of a prayer. Q. What is the prayer called? A. It is called The Lord's Prayer. Q. Why is it called The Lord's Prayer? A. Because our Lord gave it to us, and commanded us to use it. Q. Say the Lord's Prayer, will you, altogether, as the people say it at church? Q. To whom do you pray, in this prayer? A. To "Our Father," in heaven. Q. Why do you call God your Father? A. Chiefly, because I was made his child at my baptism. Q. What were you made at your baptism? A. "A child of God." Q. Yes; you were made God's child at your baptism, and therefore God became, in the best sense, your Father. But is God really a good Father to you? A. Yes; He is a better Father to me than my earthly father is. Q. How is God a better Father to you, than your earthly father is? A. God can do every thing for me which He chooses, but my earthly father cannot do every thing for me which he chooses. Q. What cannot your earthly father do for you, which God can do for you? A. My earthly father cannot keep me from being sick, but God, my heavenly Father, can. Q. Can your earthly father keep you alive when you are dying? A. No; he cannot, but God, my heavenly Father, can. Q. Can your earthly father save your soul? A. No; my earthly father cannot save my soul, but my heavenly Father can save my soul? Q. But will your heavenly Father save your soul? A. Yes; if I obey Him, He will save my soul, for Christ's sake. Q. Ought you not to love your earthly parents very much, for being kind to you? A. Yes; but I ought to love my heavenly Father a great deal more; for He is a great deal better and more kind to me. Q. You say, God can do for you every thing He chooses; but that your earthly parents cannot;-- Where do you say, when repeating the Lord's Prayer, that God is? A. I say, He is "in heaven." Q. What are the words? A. "Our Father, who art in heaven." Q. But, if God is in heaven, can He do you good here on earth? A. Yes; He can do me good here on earth, because He looks down upon me, and sees me all the while. Q. But although God sees you all the while, how can He know what you want? A. God knows what I want; because He knows all things. Q. God may know what you want; but, if He is up in heaven, can He give you what you want? A. Yes; He can give me what I want; because He can do all things. Q. God's power then is in every place, as well as His eyes? A. Yes; God's power is in every place. Q. Although God is in heaven, then, He can do every thing He chooses to do here on earth? A. Yes; He can either do us good, or can send evil upon us, just as He chooses. Q. When will He do us good? A. When He looks down upon us and sees that we are doing what He has told us to do in the Bible. Q. When will He send evil upon us? A. When He sees that we are not doing what He has told us to do in the Bible. Q. WHEN repeating the Lord's Prayer, you said "Hallowed be Thy name;"--What do you pray for in these words? A. When I say,--"Hallowed be Thy name," I pray God, that I, and all people, may fear Him and honor His holy name and word. Q. What is it to fear God? A. It is to have such an awful feeling of God's presence, as to keep me from thinking or doing any thing wrong. Q. What is it to honor God's holy name? A. It is always to speak good of God; and never to take His name in vain. Q. What is it to honor God's holy word? A. It is always to listen to God's holy word, when it is read to me; and always to try to do what it commands me. Q. What do you pray for, then, when you say, "Hallowed be Thy name?" A. I pray, that I, and all people may fear God, and, honor His holy name and word. Q. WHAT do you pray for when you say, "Thy kingdom come?" A. I pray, that God's church may be set up every place, and that every person may obey Christ, its Head. Q. What is the Church called in the Lord's Prayer? Q. Who did you say, was placed over God's kingdom? A. God's only Son, Jesus Christ. Q. What do you say, then, that you ask God for, when you pray, "Thy kingdom come?" A. I ask God, that His holy church may be set up in every place, and that every person may obey Christ, its Head. Q. WHAT do you pray for, when you say in the Lord's Prayer, "Thy will be done?" A. I pray that my will, and every body's will I may submit to God's will. Q. Where does God make His will known to us? A. In His word, and in His acts. Q. What is God's word; in which He makes His will known to us? Q. What are God's acts, by which He makes His will known to us? A. Every thing that happens to us is God's act. Q. Can you tell me one thing, which as God's act, makes known God's will? A. When I am sick; God makes me so, to do me good. Q. Can you mention another act of God which tells His will? A. When Death comes to take me away, or any of my friends, God sends it, to do us good. Q. You say, God makes known His will, thus in His word and acts;--how are you to submit to God's will? A. By wishing every thing to be just as God wishes it to be. Q. How are you to submit to God's will made known in the Bible? A. By trying to do every thing which God commands in the Bible? Q. How are you to submit to God's will as made known in His acts? A. When God sends trouble, or sickness or death, I am to feel that God does right. Q. In the Lord's Prayer, you pray, that God's will may be done on earth as it is in Heaven;-- Who do God's will in heaven? A. The angels and blessed spirits. Q. How do they do God's will? A. They do it quickly, heartily, and constantly. Q. You say, they do it quickly? A. Yes; just as soon as they know it. Q. You say, they do it heartily? A. Yes; it makes them happy to do it. Q. You say, they do it constantly? A. Yes; they never stop doing it. Q. How do you say, the angels and blessed spirits do the will of God? A. They do it quickly;--that is, just as soon as they know it;--they do it heartily;--that is, it makes them happy to do it;--they do it constantly ;--that is, they never stop doing it. Q. How then are we to do God's will? A. We must do it quickly, heartily, and constantly. Q. WHAT do you pray for, in the Lord's Prayer, when you say;--Give us this day, our daily bread?" A. First, I pray for such things as are good for our bodies on earth;--and secondly, for such things as are needful to fit our bodies and souls for Heaven. Q. What would become of our bodies, if God did not give us our daily bread? Q. What would become of our souls, if God should not give us our daily bread? A. They also, would die. Q. What do you mean, by saying, the soul would die? A. I mean that the soul would have in it no spiritual life now, and no hope of eternal life hereafter. Q. WHAT do you next pray for, in the Lord's Prayer? A. I pray God, to "forgive us our trespasses." Q. What are our trespasses? A. They are our sins. Q. You pray, then, that God would forgive us our trespasses or sins;--but, in what manner do you pray, that God would forgive us our trespasses? A. I pray that God would forgive us our trespasses, "as we forgive those who trespass against us." Q. How do others sin against you? A. By cursing me--telling lies about me--or striking me. Q. What must you do to those who thus sin against you? A. I must forgive them. Q. What, if you do not forgive them? A. Then, God will not forgive me. A. Because, I pray to Him to forgive me, just as I forgive others. Q. How are you to forgive others when they trespass against you? A. I am not to hurt them because they hurt me-- but I must pray for them and try to do them good. Q. What if you do to them just as they do to you? A. Then God will not forgive my sins, but will punish me. Q. WHAT do you ask of God, when you pray, "Lead us not into temptation?" A. I ask of God, that He would never put me into such a state of life, as might tempt me to disobey Him. Q. But, if you ask God not to lead you into places where you might be tempted to sin, ought you not to keep away from such places? and persons that would learn me to speak bad words or do bad things. Q. But do you not ask God for something else in this part of the Lord' Prayer? A. Yes; I ask Him to "deliver me from evil." Q. What do you mean, when you ask God to deliver you from evil? A. I mean to ask Him, to "save and defend me in all dangers both of soul and body--to keep me from all wickedness, from my spiritual enemy, and from everlasting death." Q. Through whom do you hope that He will do this? A. Through Jesus Christ my Saviour. Q. At the end of the Lord's Prayer you say "Amen;"--Why do you say so? A. I say so, because I desire that what I have prayed for, may come to pass. Q. What do you mean, then, by the word "Amen?" A. I mean, so let it be, as I have prayed. Q. "How many Sacraments hath Christ ordained in His Church?" A. "Two only, as generally necessary to salvation." A. "Baptism and the Supper of the Lord." Q. "What do you mean by the word, Sacrament?" A. I mean an outward, visible sign of an inward spiritual grace." Q. What is meant by a visible sign? A. It is something that I can see, used to point out something that I cannot see. Q. What is the thing you can see in baptism? A. Water put upon the person or child by the minister. Q. What is the thing you cannot see in baptism, but which is pointed out to you by the water? A. "It is a death unto sin, and a new birth unto righteousness." Q. What do you say you say die unto in baptism? A. I die unto sin. Q. What do you mean by dying unto sin? A. I mean that at my baptism God for Christ's sake, pardoned my sin, and gave me grace not to sin any more. Q. What do you say you have a new birth unto, in baptism? A. I have a new birth unto righteousness. A. I mean, that, at my baptism, I got the grace of the Holy Spirit to enable me to live a new and holy life. Q. What is the outward, visible sign, or the thing that you see, in the Lord's Supper? A. Bread and wine, given to the people by the minister. Q. What is the inward, spiritual grace, or the thing you cannot see, in the Lord's Supper? A. The body and blood of Christ, spiritually taken and received by the faithful. Q. You say, a sacrament is an outward visible sign of an inward, spiritual grace;--by whom was it ordained or appointed? Q. Why was the outward visible sign ordained? A. It was ordained, as the means whereby we receive the inward spiritual grace; and as a proof that we do receive this grace. Q. You say Christ ordained the sacraments;--did He appoint any persons to give the sacraments to the people? A. He appointed His ministers to do it. Q. Who are ministers of Christ? A. They whom Christ sends to be ministers. Q. How does Christ send His ministers? A. He does it by ordination, or "the laying on of hands." Q. Whom did He appoint to lay hands on His ministers and ordain them? A. He appointed Bishops to do it. A. They are chief ministers in the church of Christ. Q. Who was the first Bishop? Q. Whom did Jesus Christ make Bishops, when He left the world? A. He made the Apostles Bishops, such as St. Paul, St. Peter, and St. John. Q. How many Apostles did Jesus Christ send forth? A. He sent forth twelve. Q. How many did He leave on earth, when He ascended into heaven? Q. What had become of one of them? A. He had killed himself. Q. Why did he kill himself? A. Because he was a wicked man, and sold Jesus Christ to the Jews. Q. What was the name of that Apostle who killed himself? A. His name was Judas. Q. Was any one put in the place of Judas, after Jesus Christ ascended into Heaven? A. Yes, Matthias was put in the place of Judas. A. The Apostles appointed him. Q. What right had the Apostles to appoint others to the ministry of Jesus Christ? A. Jesus Christ gave the Apostles power to appoint others. Q. Was anyone made an Apostle, after our Lord went to heaven, besides Matthias? Q. Did the Apostles appoint any Bishops to fill their places when they were dead? A. Yes, they appointed Timothy and Titus and others. whom they appointed, power to appoint others? A. Yes; power was given to be handed down from Bishop to Bishop as long as the world stands. Q. Are there any other ministers in the church of Christ, besides Bishops? A. Yes; Priests and Deacons. Q. Have Priests or Deacons power to ordain ministers? Q. Who, then, ordain Priests and Deacons? Q. How many orders of ministers are there, then? A. Three, Bishops, Priests and Deacons. Q. Who have power to ordain all ministers? Q. Has any person a right to give baptism or the Lord's Supper to the people, who has not been ordained by a Bishop? Q. What is the true church of Christ? A. It is that body of Christians in which the pure word of God is preached, and the sacraments are rightly given to the people. Q. When are the sacraments rightly given to the people? A. When they are given by those ministers who are ordained by bishops. Q. How many orders of ministers did Christ ordain in His church? A. Three orders--Bishops, Priests, and Deacons. Q. Do you belong to the true church of Christ? A. Yes because I belong to a church where the pure word of God is preached, and His sacraments are given by those ordained by Bishops. Q. Has Christ promised to be with his true Church? A. Yes; Christ has promised to be with it, as long as the world stands. Q. Why is it necessary that Christ should be with His church? A. Because without Christ, we can do nothing. Q. Can we get any blessing from God, except through His Son Jesus Christ? Q. Where then are we to come to Christ to get a blessing? A. We are to come to Him in the church, of which He is the Head. A. Because, "He is Head over all things unto His church."